Polishing large, flat panels like roofs, hoods, and doors is made easy with the Ouya 5'' backing plate, but smaller and more contoured spots are easier to polish with the 5'' torque backing plate. Bi-directional cooling channels funnel fresh air in to cool the buffing pad, backing plate, and machine Polisher with every spin around the Ouya machine. Dispersing heat from polishing extends the lifespan of buffing pads, backing plates, and the machine Polisher itself. Superior dual action polisher backing plate specifically designed for torque Random orbital polishers. Provides a firm attachment, yet allow for easy removal of abrasive disc. Centers compounding or polishing pads with great accuracy. 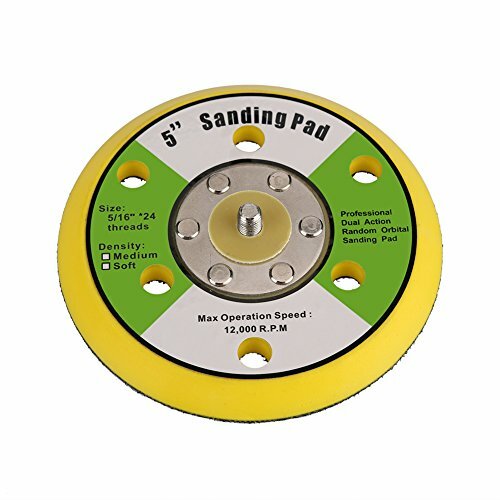 Fits all standard (5/16 in shaft) slow-speed polishers,Medium density foam construction provides support and flexibility for finer finishing and longer pad life. The low-profile plate features a beveled edge to help fit the buffing pad into tight areas around brush guards, roof racks, door mirrors, bumpers, door jambs, and more. If you have any questions about this product by Ouya, contact us by completing and submitting the form below. If you are looking for a specif part number, please include it with your message.